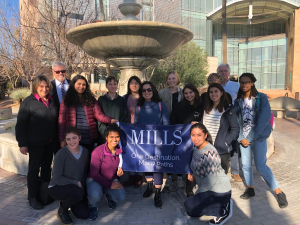 This article is the introduction to a series about the immersive experience of the Mills students who traveled along the Arizona/Sonora border and the real issues that the families and children within these communities face. 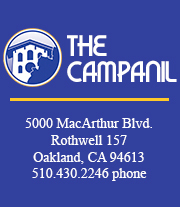 The writer of this piece was also involved in the trip and while opinions shared throughout the series may not represent The Campanil staff, we felt this was an important issue to report. At the beginning of the year eleven students traveled with two members of Mills’ faculty, Professor of Biology Dr. Lisa Urry, and Daisy Villa, an academic navigator, to participate in a week-long January term 2019 course based along the U.S./Mexico border. The study away course was designed by Urry to provide an immersive experience for students to learn about the socio-political, cultural and ecological issues that impact the people living in the border community of Nogales, Arizona and Nogales, Sonora. The communities on either side used to be one before the construction of the border wall split them into two. The group spent eight days traveling throughout the border towns, meeting with several humanitarian organizations, activists, and locals of the community. In between a busy schedule, all the students updated a blog throughout the week that detailed their everyday experiences. The students shared that one of the most profound experiences was being able to sit in on Operation Streamline. The court proceeding is a policy that began in 2005 to prosecute nearly all undocumented immigrants crossing the border in certain areas through the federal criminal justice system. It is a collaborative effort by the Department of Homeland Security and Department of Justice in the United States. According to the Vera Institute of Justice, the federal court system had a 159 percent increase in all immigration cases between 2005, the first year of this court policy, and 2013. Court records show that about 12, 400 people were prosecuted through Operation Streamline in Tucson, Arizona every year for the past five years. Children under 18 years old are not prosecuted, but adults are held under terrible conditions. Their items are confiscated when they are apprehended and they remain in the same clothes while detained. People awaiting trial are held in a large pod with small activities. The operation holds a zero-tolerance approach to illegal border crossings by criminal prosecution. Up to 75 people are tried at the same time, forced to wear shackles in the courtroom. Use of electronics were strictly prohibited to the students while entering although they managed to see a U.S. Marshall playing a game on his phone during the proceeding. According to the law, crossing the border illegally is a misdemeanor, while deportation after re-entry is a felony. Typically, lawyers are assigned three to four people and are given basic biographical information, criminal history and list of prior deportations. Most of the defendants do not speak English, yet are given court documents to sign in English. Many of the lawyers speak some Spanish, but when the defendants see a judge, they use earphones to hear English translated rapidly. There are three typical case scenarios within Operation Streamline. The first are dismissed cases. These are court cases dismissed due to language barriers. The defendant will usually automatically get time served or deported. The second are petty misdemeanor cases where people are prosecuted for not going through the port of entry where they are searched. The third scenario are reentry felon cases. These are cases where migrants were previously deported and attempted to cross the border again illegally. In court, defendants are asked quickly if they understand their rights, if they understand their sentence, and if they understand that they have come to the United States illegally. Many people trying to seek asylum do not understand the law. They often believe they have to just show up and request asylum. A person can legally ask for asylum from inside and outside the United States. If a person is outside, they can go to the American consulate. After that day of Operation Streamline cases, the students were able to speak to Judge Bernardo Velasco. Judge Velasco had spoken out against Operation Streamline before, but he is participating in a system seeking to criminalize migrants for illegal border crossings and seeking asylum. 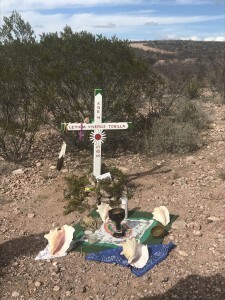 The day before leaving Nogales, the students learned that Judge Velasco had found a group of Arizona activists guilty of breaking the law when they did not obtain a permit to drive on prohibited roads and left food and water for migrants where many sets of human remains were recovered in the last few years. The activists were from an advocacy group called No Más Muertes, translated as No More Deaths. No More Deaths is an organization that attempts to provide humanitarian aid to all migrants trying to cross the border. The students were involved with a similar organization called The Samaritans, who led them on a migrant desert search. The students carried jugs of water as they walked along a path that many migrants had used before them. Bartolucci found great significance in the Borderlands experience and hopes financial aid can be offered in the future to give access for more students to be able to participate. She holds a marker of the trip with her everyday in the form of her screensaver. Everyday she opens her phone and sees the photo she took from the cross-planting ceremony on her trip. 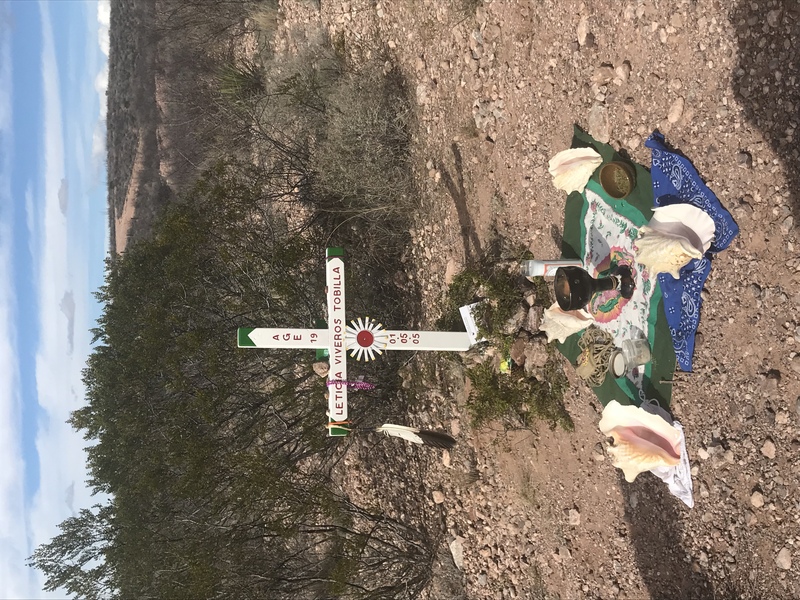 She participated in a cross-planting ceremony for a woman named Leticia Viveros Tobilla, a 19-year-old migrant who died trying to cross the border. She is reminded of the loss of a young woman and the barriers she would have experienced as an undocumented migrant living in the United States.